The elegant and classy Toni Elling is a burlesque icon who broke down many barriers as an African-American woman performing in the 1960s and 1970s. Born in 1929 and raised in Detroit, Michigan, Elling worked as a telephone operator for nine years before her big career switch. Reportedly fed up with being passed over for promotions based on the color of her skin, the 32-year-old Elling decided to pursue burlesque at a time when many of her peers were retiring from the tassel twirl. Elling derived her stage name from her famed friendship with jazz great Duke Ellington, and is affectionately called “the Satin Doll” and “The Duke’s Delight”. She also hung out with Ella Fitzgerald, Sammy Davis Jr., Jackie Wilson, and boxer Joe Lewis, to name a few. 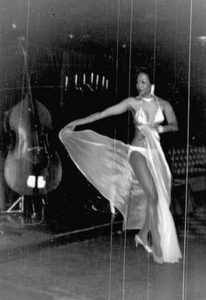 She got her start dancing as the opening act at the Flame Show Bar in Detroit with Wilson before moving to Los Angeles in 1962, and performed well into the 1970s. Elling continues to make appearances at burlesque festivals and events, and is beloved for her wisdom and advice to younger generations of performers. She was honoured with the Burlesque Hall of Fame Living Legend Award in 2014.